Small bathrooms can be limiting. Everyone dreams of large, expansive bathrooms with large tubs, sprawling countertops and more, well at least I do. However, we need to be realistic with the space we’ve been given within our bathrooms. After all, not everyone has the money to afford such houses. Bathrooms are where we spend quite a bit of our time while at home. We go there to be able to clean up daily as well as to be able to relax and de-stress in a nice bubble bath. But if we have a tiny bathtub and a small space, it can be difficult to accomplish any of those things. When it comes to small spaces, there are many things that you can do to make it appear larger. Bathroom color themes should be considered above all else before thinking about replacing fixtures. Simply changing the color to something lighter and more vibrant can make a significant difference in what the bathroom will look like. Light blues will fill the space and make it look as airy as the sky. If white is too boring for you, try a rich cream color. Using darker colors will confine the space and make it feel darker and smaller than ever. When most people have a small space, everything inside of it is miniature as well. Tiny bathtubs shouldn’t even exist. No one can fit in them comfortably, so why even have one? If you can’t stretch out and have the horizontal space, you can still enjoy the same volume as those luxurious homes. The different is going for a deeper tub. A deep tub can turn a tiny bathtub into something you’d want to soak in daily. Deep bath tubs can transform a bathroom. They are meant for soaking but can relax the entire body because of being able to submerge the entire body into the tub. Deep bath tubs also help with chromatherapy, which is relaxation in conjunction with comforting hues. So now we’re back to bathroom color themes. Choosing colors based upon how they correspond with emotional states will enhance your bathing experience. Cool colors will ensure that you sink into a calm state, such as blues and greens. Vessel sinks are another thing that you can add to a small space to enhance the look. Vessel sinks are often free standing and made of glass or metal. These ensure that there is room for other things in the bathroom instead of a bulky cabinet surrounding a boring sink. Vessel sinks can be found in a variety of colors that will go with your bathroom color theme and make the space look very classy. When I was looking for a vessel sink I noticed that some have higher sides than others, make sure you will be comfortable reaching over the top of the vessel sink. I have noticed that some of the newer vessel sinks are not as “tall” as some of the original designs. Bathrooms don’t have to be small. Whether the space is small or not, it doesn’t mean that you have to have a tiny bathtub or a tiny anything. It’s all a matter of how you choose to theme the bathroom and the fixtures you choose for it. Every bathroom has some basics to it that everyone must have. Toilets, sinks and tubs are standard. But which ones they choose is completely up to the owner of the house. Small spaces can be challenging, but I happen to like a good challenge. I also happen to like a nice soak in a deep tub. 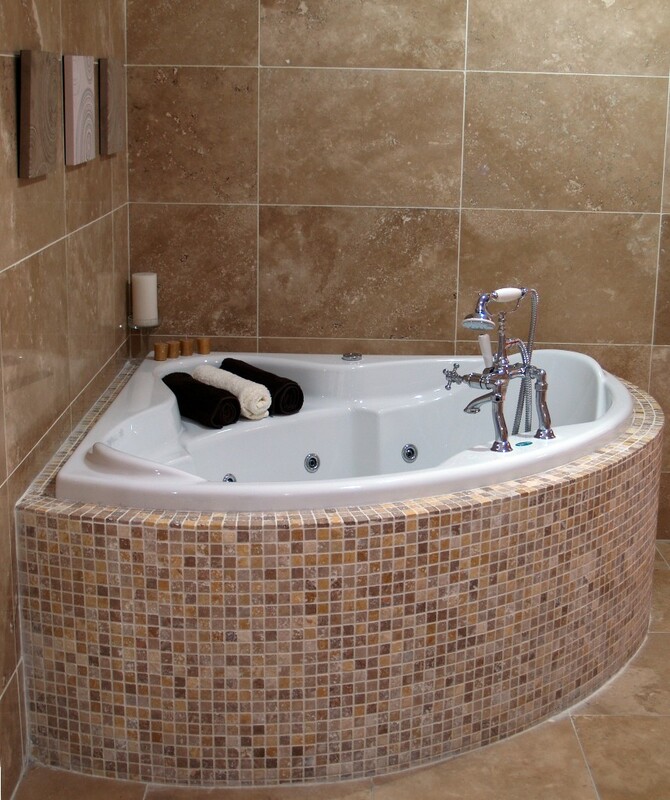 Once you’ve gone with a deep tub for your small space, you’ll never go to a regular tub ever again.